A crown is a lab created “cap” that serves as a replacement for a tooth. It fits over a tooth or dental implant. Crowns restore a tooth’s strength, function, and appearance. Essentially, a crown becomes the new outer layer for a tooth. Crowns are used for several reasons. Following root canal therapy, crowns are used to protect the remaining tooth and provide function. Crowns are used to cover a tooth with large fillings if the tooth structure has weakened. The teeth that are next to bridgework may be crowned to provide the bridge with a solid source of attachment. Additionally, a crown may be used with an implant to replace a lost tooth. A crown can also protect teeth with cracks and cover teeth that are discolored, chipped, or poorly shaped. Crowns are created in a lab based on molds of your teeth and gums. Crowns are made of various materials depending on the strength requirement and desired appearance. Crowns can be made of porcelain, metal, such as gold, or a combination of both. You may need a crown if you experience tooth fracture or loss. A crown is usually used in the final step of root canal therapy. A crown may be required if your tooth can no longer support a very large tooth filling. You may need crowns to support bridgework. Your dentist can evaluate your need for a crown by examining your teeth and gums. Your dentist will check for loose, fractured, or decayed teeth. X-rays help identify changes in your teeth, bones, and gums. Treatment with crowns usually requires two dental visits. First, impressions of your teeth are made to use as a mold for creating the new crown, and your tooth is prepared for crown placement. At your second visit, the new crown is secured in place. During your first appointment, your dentist will use molding material to create an impression of your teeth. A model of your teeth will be made from the impression. A lab technician will use your model as a guide when creating your custom made crown. Also during your first visit, your dentist will numb the area surrounding the affected tooth and prepare your tooth for the crown. 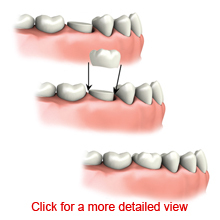 A tooth typically needs to be made smaller to enable the crown to fit over it. After your tooth is prepared, your dentist will cover it with a transitional “temporary” crown to protect it until your permanent crown is placed. At your second appointment, the temporary crown is removed and the tooth is cleaned. Your dentist will evaluate the fit and appearance of the crown. Your dentist may adjust the crown to accommodate your bite pattern. Finally, your new crown is cemented in place. Your new crown can last for many years with proper care. It is important to brush your teeth at least twice daily and floss at least one time each day. Pay special attention to the areas surrounding your crown. Avoid grinding your teeth and chewing on hard items such as candy or ice. This can damage your crown.